Analysing the Winning 2013 Supercoach Team – He’s No Dim Wit! Mr John Bruyn walks the streets of Sydney an ordinary man. His anonymity, much like his beard, is well kept. 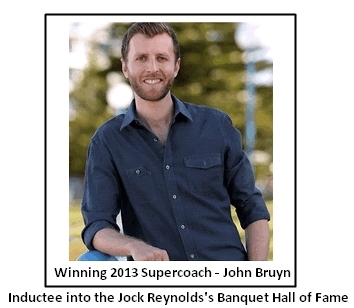 But to the Jock Reynolds Community, Mr John Bruyn is a living legend whose picture hangs proudly on the walls of The Jock Reynolds Banquet Hall. In this article I will be taking a close look at Mr Bruyn’s starting team and the strategic moves that were made along his winning journey in an attempt to gain insight for us as we prepare our 2014 squads. The DimmaWits Starting Squad as analysed by the 2013 Higginator. All but one of the 13 players selected priced over $450,000 remained in the squad (Zorko was the only failure). The Starting Squad contained six Port Adelaide players. In 2012 Port Adelaide won only 5 games. A newly appointed coach in Ken Hinkley and a 9 player turnover to its senior list resulted in a stunning form swing and a berth in the 2013 finals series. TheDimmaWits started with 5 Port rookies, and with the exception of Kane Mitchell, all played and appreciated in value quickly enabling early squad upgrades. Significant reductions to spending in Defensive and Ruck lines enabled TheDimmaWits to invest heavily in the Midfield and Forward lines. The Midfield spend was significant with four of the top ten most expensive players being selected (Abblett – No. 1, Pendles – No. 3, JPK – No.6, Cotchin – No.10). A clear “swing-into-Midfield” strategy was employed with ten swing options available when trading rookies out of the Midfield. The substitute trading rule that was introduced in 2012 reduced the need to have matching swing sets across lines. TheDimmaWits exploited this feature ensuring that there was no compromise to his all important initial Midfield selections. You may feel that your starting squad was very similar to this. What made his team beat mine? It’s now time to de-construct the winning moves by looking at the trades that TheDimmaWits made. A feature of this winning team, a feature that gives us all hope, is that mistakes were made. Not only in the initial squad but also in trading. TheDimmaWits traded hard early to correct his squad and to settle the bones of his team early. Karnezis became Kennedy, Kommer was traded in only to be traded out after scoring a 92 against Fremantle – early cash generation! The important Round 3 trades of Mitchell and Macaffer to Jones and Dwyer were significant contributing factors to this team’s success. Not only did Jones and Dwyer score consistently high allowing the Emergency loop hole to be exploited, but these two were cashed in after seven rounds for a neat $500,000 profit! While starting with a 3 Rookie ruck set-up, TheDimmaWits was quick to jump on an inform Leuenberger in Round 4. Leuenberger only played 3 games in 2012 and missed Round 1 in 2013. After scores of 101 and 93 in Rounds 2 and 3 TheDimmaWits jumped on him for 6 rounds, trading him out for Tom Nicholls and profiting $148,700. The greatest trade for the season was that of Travis Cloke. Just as the inexperienced were jumping on an inform Cloke, TheDimmaWits traded him out to get Stevie J into his team. Cloke had just come off scores of 133, 195, 63 and 124. In Cloke’s next game he scored a 36 while Stevie J scored 123. A genius move! TheDimmaWits, like all coaches, had to deal with injuries. Thomas was traded in just prior to his injury and traded out for Priddis. Birchall was traded in at Round 12 only to injure his knee in Round 13. The shoulder injury to Jobe Watson, however, may have been a blessing in disguise. Watson was traded for Selwood prior to Round 16. From Round 16 onward Selwood averaged 155. While the Selwood trade may have been good fortune, the move to trade O’Meara to Malceski for Round 13 was an example of why Mr Bruyn was thoroughly deserving of this win. TheDimmaWits were ranked the number one Supercoach team in Round 12. At this stage, winning teams of the past would have checked their nearest threats and traded to negate risky points of difference. None of the top teams had Malceski. Rather than trade in players such as Heppell or Hanley, Malceski was traded in due to Sydney’s soft upcoming draw. A score of 156 followed in Round 16 when Sydney played GWS. While TheDimmaWits had ran out of trades by Round 19, by Round 18 trading swing links had been set up with a DEF/MID link, a FWD/MID link, a FWD/RUC link and also a FWD/DEF link. The scence was set to cruise home with cover across lines without the need for trades. In fact, when Ricky Henderson went down in Round 21 it didn’t matter, the game was already won. It’s time Community. What important lessons do you take from this? Voice your thoughts below and let our collective brain fire with startegy for the upcoming 2014 Supercoach season! p.s. On behalf of the entire Jock Reynold’s Community I would like to congratulate you John – you played a fine game! Makes you realize that the very best still make mistakes, and big ones ! One thing I've noticed is that with the exeption of Karnezis, he did not go with any "break out" potential players.. He went with players who would score the points. Yeah thats true, He went into the year with a loaded midfield and foward line..
Will that mean this year we should be loading up our midfields and defences? I doubt he lost much sleep over it! I think that most of the past winners of the big one have not won their leagues. Fantastic breakdown, Higgo. Much to digest, but even more to assist R1 structure and trade strategy planning. One question: why were this years values for the Player Type Breakdown $50K higher? Good question my American friend. There has been a changing of the pricing structure this year. Highly rated rookies have increased while the Premo's have decreased. Al Paton form the Superfooty team explains this well in the interview we had prior to Christmas. What change will this have on our starting squads? Well, maybe we can afford to entertain someone like Tom Boyd OR continue to run with Guns n cheapo rookies and try and squeeze one more Premo into our starting teams. p.s. My whisper is that The Doggies may be this year's Port Adelaide. Ah yes, I remember that interview. Brain must be clotted from too many warm Bud tall boys. Doggies (and Lions) have been renting timeshares in my Higginator. Actually revamped after reading article to reflect John's initial team. Much nicer. Yet, not as many promising rooks. Well, wait and see what NAB has in store. Appreciate the clarification, S.O.S. (Sovereign of Strategy). Was a trade missed there with pittard being on the traded out list but not on starting list, while Pitt the complete opposite? I would assume because Pitt didnt play any games it is a typo and it is supposed to be Pittard from round 1 starting team. Thats my assumption. oh Jock ole mate, how do we go about getting one of your James Camerons Avatars? Great analysis, Higgo! Makes me wonder, would I be confident in keeping my over-450k players for the long run? Yeah, all except maybe Luke Parker. Re-thinking the way I'm approaching my team selections. Seems like for this year is an elite and gun strategy with the modification of adding undervalued "elites" like Beams, Murph and Buddy. Suckling and Martin perhaps are the exceptions. I'm leaning on waiting on Martin. But we'll see. Definitely an eyeopening analysis, Shinboner. Spot on throttle. Spot on. Players that have given me fits are players like L. Hunter, Gaff, Bundine, Lamb and Clark. You see the value/upside looking at their stats. But is it worth putting in your initial team? Digesting DimmWit's trades and Higgo's analysis makes me think even if they have a strong NAB, it's better to wait and use them to trade out those are not performing. Or maybe that's pretzel logic. One rung up and you have someone like Jack Darling at 413k. He's in my team and should push up into midfield this year, according to reports. I hate to use the dreaded 'P' word, but he has SC potential. Even then, should we still be sticking to G & R? Not sure. Think a lot depends how large the rook pool is when R1 selections are made. Doesn't seem as deep as last season. Could be wrong. The lot could go gangbusters in NAB. Know that I may be knee jerking to Higgo's article, YET Dimm's starting structure was built to last, at least from the elite standpoint. I see the argument to have or have not but I think everyone can say "Ya need to trade yor way to the top"
I think I was way to unwillinging to go with my gut last year and I remember when it all fell apart and I knew I was playing catch up…. Rnd 5……Everything went Bad not Breaking Bad ,I was still riding the SC Brumby but "Wait one more week ….." Nah that's it Crouching Tiger and me Keyborard have other Plans…….Spell Check Podis…Podsleadly….Naw Finally figured out what eat more chips is …. "On me way to get paper ,Beers (Tiped mindyou (#$.00) ) I stoped to get a Big M at local Chippy —- Guess What? Standing in kine to purchase said Big M I heard some one Shout!!! FRANK!!! Did ya put more Chips IN…So I m a happy Camper..I got Cold Beers the Weather is not like the inside of a Microwave and Get More Chips in has been resolved…Happy Days…Bugger I just realised I left me wallet there. Also having headaches about those types of players, they definitely have potential but I reckon that the best plan might be to wait and have them as downgrade options for those who fail. Tend to agree. Best plan may to do two team structures. One G'n'R (now known as the "Axl Rose") or one with undervalue/potential breakout players splatter about (the "Dead Alive"?). Think I'm going to do that just to feel less underprepared. Hunter, Hrovat, McCrae, Talia, Honeychurch , Smith even Tommy Williams all played very little last year, but can score big if they get to play. Josh Prudden is one to watch in the second half of the season. This still doesn't work. Was keen to join….but not sure when it will be actually open…. I'm not sure if this has been touched on as yet, but we need to also consider that when it comes to downgrades this season cash generation may not be as plentiful. We may find that instead of downgrading to a 120k player it could well be substantially higher. Which may make upgrading all the more difficult. With that in mind I think this year the key is to find 2-3 300-450k that could play out the season & score well. Hey Pieman, Jock and extended community, great to be back from my Supercoach Sabbatical. I reckon you are spot on with that pickup. With higher rookie prices, it's gonna make trading up much more difficult. I know last year I was one of many who banged on about having to many trades, and I believe this pricing structure could go a long way to improving the game. Picking those long lasting mid pricers will be the key this year I believe. Gday Freako. I was on the too many trades band wagon last year as well. I had a massive rant to Jock about it last year & he discussed my opinion in one of the pod casts. But I think with the price changes it's more of a level playing field. Using a 1 downgrade to 1 upgrade rule of thumb in years gone by as a trading strategy is probably going to change. It could be more like 7-8 downgrades for 5 upgrades (super premiums). Looking at the numbers & factoring in (correctional, injury, suspension, finals trades etc…) that we may need about 13 players in our squad to play out the year. We cant start with 13 premiums round 1, it just wont happen. So the selections of under-priced premiums has never been more important. And as Favilenko points out the GWS & Gold Coast type cash cows will be scarce. Thanks Pieman ! Just a few bad trades following the pack eg [hanly nic nat daisy thomas } etc instead of going on my gut instinct ! Your not alone. I suffered with those 3 as well. I also got Birchill at his peak price. I also started with Ryder as a POD. We live & learn. Hope you can improve again although that won’t be easy! Gold Coast and GWS were gold minds with rookies coming from everywhere.. However Port Adelaide i think last year was just as effective (especially in the backline) But the names of Wines, Neade, Stevensen, Heath, Colquhoun, Pittard and Mitchell, Really gave us a fair crack at the rookies. This year it looks like Brisbane is the team with the rookies, Beams, Aish, Taylor, Cutler etc..
interesting…2012 power to the people never traded out buddy franklin, 2013 dimma wits never traded in the bud of lance alot…what will 2014 bring?? Would love to know what strategy John employed regarding Captain selection each week. VC Loophole employed each week no doubt. But then the tough task, if VC gets 130+ keep him, <130 roll with Gary Ablett?? or 120+ I'm sure everyone had a different benchmark. It'd be good insight to find out. After Rd 10 trades he had 59,800 left, but he spent 61,500 in Rd 11? I might have mucked up my calculations but I have checked around 10 times. So I’m not sure what has happened? I mean after Rd 11 trades not Rd 10 and he spent 61,500 in Rd 12. Great read! It was great tweeting with @imjohnb throughout season 2013, helping each other gain that extra few points above the rest. Looking forward to the same this season. Hoping to crack into the top 100 in 2014 at least! Help me out Higgo, your last para referred to all these trading swing links that were set up but for the FWD/RUC link there's no starting FWD with a ruck dual position and for FWD/MID there's no starting MID with a fwd dual position. Is there something fundamental in the whole swing arrangement that Im missing??? This is well covered in this week's podcast, starting from around the 3 minute mark. **** – John DID NOT start with Buddy of Dangerfield and I think that was PIVOTAL to his win in 2013, which I think hasn't been called out obviously enough here. "Last week, I had bold hypothesis (which I still believe), the winner of SC 2013 would have started with a team WITHOUT either Franklin or Dangerfield. Both these “elite premiums” (in my opinion) have just lost way too much value for a winner to absorb and still beat every other team that did not start these players. " back, you should understand how you can make this happen. Did your boyfriend leave you and now you want to know “how to get my ex boyfriend back when he has moved on’. my view its truly awesome for me. That is still a mystery to have balls of steel trading out Cloke after those huge scores. I think I may have actually traded Cloke in around then from memory. Note to self. "trade in dropped premiums – avoid the bandwagon who chase last weeks high scores"
Remember in the podcast John said you have to be a bit ruthless with your trading. The advertising and marketing helped in its own way by providing huge job opportunities. Lots of people await New Year's Day to generate a new beginning to their old habits. Simply take some time to imagine a day full of precisely what you want in your new calendar year. The New Year has arrived and there's a lot to anticipate. It is a great way to rekindle old friendships and make new friends. Why some people must wait until a new year to decide on an objective is beyound me but all the exact same setting an aim is almost always a positive thing. Understanding how to say happy new year in Chinese will arrive in useful no matter in which you happen to reside. New Year favors are simple enough to come by, and in the event you can't find one which is ideal for you, why don't you go ahead of time and create your own! So if you're free on New Year 2018, you've got to go outside and enjoy fireworks with friends and family. New Year is my favourite holiday. Therefore, a new year is extremely special to everyone. It is the only event celebrated on a grand scale all over the world, though it is not a festival. Happy new year is among the oldest event of the planet that mostly people like to celebrate and help it become remarkable for the entire life. In addition, in the time of communications, you don't need to wait to observe individuals to wish them Happy New Year.